Millions of $250 checks have been sent to Medicare beneficiaries in recent weeks — and more will be sent in the four weeks remaining until election day. The Affordable Care Act, a new law passed by Congress and signed by President Obama on March 30, 2010, provides a one-time rebate to help with your drug cots. The rebate is sent automatically to most people enrolled in Medicare Part D who reach the Medicare drug plans coverage gap (“doughnut hole”) in 2010…. As part of this new law, starting next year, you will get a 50% discount on covered brand name drugs if you reach the coverage gap. On top of this, Medicare will add even more savings over the next several years until the coverage gap is closed by 2020. The Affordable Care Act has many other provisions that protect and strengthen your Medicare, reduce your costs, and give you and your familymore control over health care…. It’s the old “something for nothing” trick. In this case, millions of old folks are getting something for nothing, while millions of younger folks will be getting nothing for something — their tax dollars. But the tax bill hasn’t come due yet because the federal government is still able to borrow money from abroad. And so, most of the people have been fooled — for the time being. By the time they understand what’s happening, it will be too late for them to do anything about it. Derived from this article and its predecessors at Rasmussen Reports. Poll results before passage of Obamacare represent strong approval minus strong disapproval. Poll results after passage of Obamacare represent strong approval of repeal minus strong disapproval of repeal. 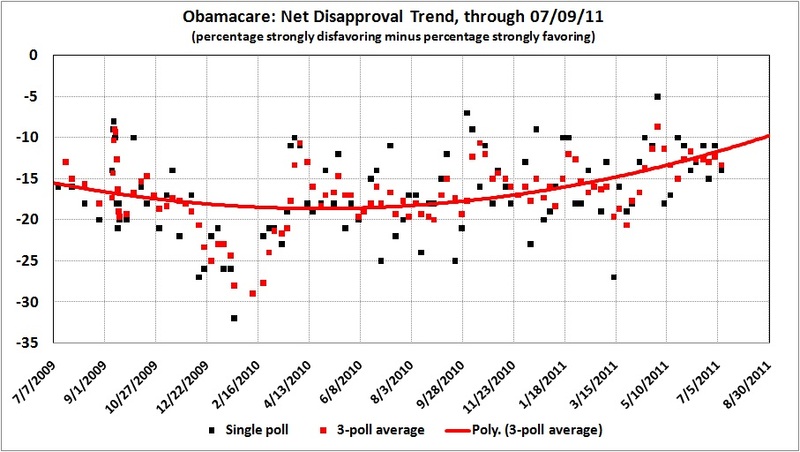 The steep decline early in 2010 reflects “fashionable” pre-enactment resistance to Obamacare among independents, many of whom quickly changed their mind and became “fashionable” supporters of the fait accompli. The polynomial fit (curved line) simply highlights the trend to date, and does not necessarily indicate Obamacare’s future popularity. But … if the upward movement continues, Republicans will find it hard going to repeal Obamacare, even if they win the Senate and White House in November 2012. The present budget crisis could lead to a paring back of Obamacare. But if the crisis is resolved decisively, Obama (if not Democrats generally) will get much of the credit, and it will be more difficult to unseat him — unless job creation and economic growth remain in low gear. This entry was posted in Electoral Politics and tagged Obamacare. Bookmark the permalink.